This is the Top 10 list that I was about to post when John posted his Favorite Bird Songs list. I wanted to start a new list by posting my "10 Most Wanted Birds". The rules are simple: Post a list of the 10 species that you'd most like to see. You can limit it to a geographic area or cover the whole world. Tag a few people and they in turn will post their lists on their blogs. I'm not sure I got the mechanics of this whole meme thing down, but here it goes anyway. Actually I did one of these already. At the very beginning of the year, I posted a list of ten new species that I wanted to see this year. (I did one for DC, too.) Now that I have seen half of those already, the list really could use some updating, so here is the new version. Since I do not know birds outside North America that well, I will stick to the ABA area. The first five are left over from the old list; the rest are additions. Somehow I keep missing this species, even on field trips when other people see them. Since I saw a Cerulean Warbler in May, the Horned Lark may end up replacing the Cerulean Warbler as a nemesis bird. Plus I think that open-country birds are cool. When I made the original list I waffled between this and the Mourning Warbler. As it turns out, I did see a Mourning Warbler, so Connecticut stays on the list. As I noted in my original post, the rail family is a big gap in my life list. Really I would be happy with this species or any of the other rails. They are pretty tough to find. I do think that the Sora has a neat call. We get a few of these in winter every year, but the species is never guaranteed in any given location. This is another occasional winter visitor that I have not seen. Usually seeing one requires a trip farther north than where I live. One of the few eastern wood warblers that I have not seen or heard. I missed this one while I was in Seattle, but there should be more opportunities to see one in the future. These game birds must have the most comical voice of any North American birds. One day I would like to stand out on the prairie and watch them in action instead of just listening to the CD. I have been interested in puffins since I first learned about them way back when I was a kid. One of these days I will take a trip up to their breeding grounds to see puffins and other alcids. This must be one of our most distinctive woodpeckers. Perhaps I will get a chance to see its clownish face on the west coast sometime. As for tags... I will tag Pamela of Thomasburg Walks and Rob the Birdchaser. And I will send this back to Jersey by tagging Laura. For a different take on Pilgrim on the Great Bird Continent, see the reviews at 10,000 Birds and Birdchaser. After almost a week of being shut down, most of Rock Creek Parkway and Beach Drive are now open. Most of Beach Drive and Rock Creek Parkway through Rock Creek Parkre-opened Friday after being closed for several days because of fallentrees and mud from the recent storms, according to U.S. Park Police. Approximatelyone mile of Beach Drive between Joyce and Broad Branch roads willremain closed for some time because of "serious structural damage tothe roadway", said Sgt. Scott Fear, a spokesman for the Park Police. "It doesn't affect traffic too much," Fear said. "You can go up GloverDrive and go around it." Last night Al Gore appeared on the Daily Show to discuss his new movie. You can see the video at Crooks and Liars. The National Zoo is moving the domesticated ducks and poultry away from its Kids' Farm to guard against poultry flu. In what was described as a precautionary measure, 18 ducks and 27 chickens were moved to the zoo's Conservation and Research Center in Front Royal, Va., last week to guard against infections caused by influenza viruses that can occur naturally in birds. This is happening even though there have been no reported cases of H5N1 in North America. Berry stressed that there have been no known cases in the United States of what is called highly pathogenic avian influenza, including a particularly lethal strain, H5N1, that has spread to many parts of the world. More than 150 million birds have died, killed by the disease or slaughtered to control its spread. If the zoo waited until a case occurred in this country, Berry said, it might not be able to move the domestic fowl and would probably have to euthanize them. "We didn't want that to be our only option," he said. Zoos have to take precautions, I guess. But Washington hardly seems like the first place H5N1 would appear in North America, so presumably there would be adequate time to move the birds if this flu does show up in the Americas. In the meantime, the move seems more likely to feed hysteria than calm visitors. The article notes that this does not affect any of the birds (domestic or wild) around the bird house. As I referenced in a previous Loose Feathers post, researchers watching a colony of whooping cranes in Wisconsin believed that a pair of whooping cranes had hatched a chick. Well, now this news has been confirmed, and it turns out that the pair hatched not one, but two chicks. 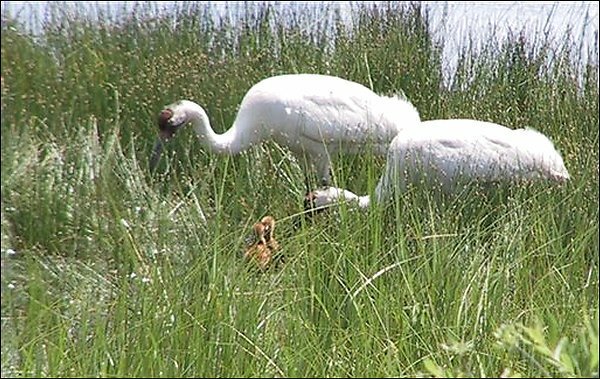 For the first time in over 100 years, there are now whooping cranes breeding in the eastern United States. As part of the project, now in its fifth year, cranes hatched in captivity at the Patuxent Wildlife Research Center in Maryland have been raised at the Necedah refuge and led south by ultralight aircraft in the fall to the Chassahowitzka National Wildlife Refuge near Crystal River, Fla. They migrate back north on their own in the spring. The only other migrating flock of whooping cranes numbers about 200 birds. They fly from Canada to winter on the Texas Gulf Coast. The whooping crane, the tallest bird in North America, was near extinction in 1941, with only about 20 left. The event marks a milestone for Operation Migration, the group that has led the charge on restoring whooping cranes to their former habitats. See their website for more on the recovery effort. Today the rains cleared and the sun came out again. I walked over to the Indian Museum to see what was going on in the wetlands. One of the red-winged blackbirds was again foraging by walking on the lilypads. It is amazing that it does not slip and fall into the water. On a more serious note, the extra water is causing problems along the waterways, most seriously in the Rock Creek watershed. In Montgomery County, emergency crews had knocked on the doors of 700 houses and 500 apartments by 5:45 a.m. today. They told those who answered to grab any necessary medications and other essentials and evacuate, because the dam holding back the waters of nearby Lake Needwood was leaking and could fail. County officials received the first reports of leaks in the earthen dam about 7 p.m., Romer said. The water level for the 75-acre lake was more than 25 feet above normal. Officials said engineers began working at daylight to determine if the leaks could be repaired or the dam otherwise shored up. They said waters appeared to have stopped rising for now. Lake Needwood is in the Montgomery County portion of Rock Creek Park, along the creek's western branch. Deep in the woods of the mid-Atlantic Piedmont and the forests of the Appalachians, one may find a veery, a member of the thrush family. Slightly smaller than a robin, the veery has a rufous-brown back, white belly, and light rufous spotting at the top of the breast. In the dark, moist understory preferred by this species, individuals can be hard to spot. A veery will scurry along the forest floor from one inconspicuous place to another, all the while keeping a close eye on passers-by. Luckily, sight is not the only way to enjoy this species. Despite its plain appearance, the veery is a prodigious songster. In fact, it sings my favorite bird song. The notes are resonant and cascade downward in a long stream. Even over cheap computer speakers, the song is beautiful; in a forest, the song has a wild and unearthly quality. 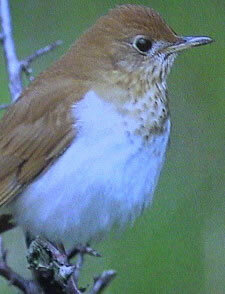 Like other thrush songs, the veery's song is well suited to reproduction in standard musical notation. Here is one attempt to transcribe veery songs. While the instrumental version can match the pitch and rhythm of the song, it cannot match the beauty of the veery's performance. When first I heard the nightingale a long-lost love deploring. I longed to hear a simpler strain,—the wood-notes of the veery. I only know one song more sweet,—the vespers of the veery. And yet, with every setting sun, I listened for the veery. I fain would hear, before I go, the wood-notes of the veery. The nightengale, laverock (sky lark), and blackbird are all European birds whose songs were celebrated by British poets. We have The Blackbird by Alfred Lord Tennyson, The Lover's Morning Salute to his Mistress by Robert Burns, and Ode to a Nightengale by John Keats. (One can certainly find more examples for each bird.) As the poet suggests, the veery deserves its place alongside these renowned songsters. If you want to look for breeding veeries in Washington, DC, check in Rock Creek Park and Archbold-Glover Park. In migration, veeries may appear at either of those sites or at the National Arboretum. In the Blue Ridge, check the forests at higher elevations of the Blue Ridge Parkway. Cross-posted at Blue Ridge Gazette and A DC Birding Blog. A study of ice cores has shown that the earth is coming out of a cool spell that began about 5,200 years ago. The cores show a sudden change, likened to a "cold snap," suggesting that future change due to warming could also come suddenly. The same ice core study corrobates that a sudden warming has occurred in the past half-century, and the change is out of line with normal warming and cooling patterns over the past 2,000 years. More interesting to me is the other end of the study's time frame. But the finding likely to cause the most debate is Thompson's conclusion that a swift and sudden cooling of the climate five millennia ago occurred simultaneously with key changes in civilizations. Thompson said he does not know what caused the abrupt change -- one possibility is a "mega La Niña" shift in upper air currents. But he said the evidence from such diverse sources as Mount Kilimanjaro; African lakes; Greenland and Antarctic ice cores; the Andes and the Alps point to a sudden arrival of cool and often wet conditions, all about the same time. That time saw cities form in the Nile Valley and Mesopotamia, his paper says, and the end of a humid period in Africa that "seems to have begun and ended abruptly, within decades to a century." There is no doubt that environmental factors have played an important role in shaping human history. At the most basic level, cities are planned and constructed based on the availability of natural resources - water for drinking and transportation, fertile land for raising food and livestock, mineral deposits, elevated or difficult terrain for defense from attack, and so on. Epidemic disease and repeated crop failures can weaken a civilization - especially one confined to a small area - to the point that resistance to outside pressure becomes impossible. Relatively stable features of the landscape and sudden disasters are easy to measure. The former mostly stay the same or at least leave evidence behind. The latter will also leave evidence - sometimes physically (like a volcanic eruption) or as part of the written record (like the Black Death). Long-term influences like climate change are harder to connect to specific historical events, as their "fingerprints" are less obvious. That makes them no less real. If the rise of complex civilizations can be correlated to changes in climate, it would go some way to understanding why it happened at that particular time, and in those particular places. Early this morning I took a walk on the Mall while there was a substantial lull in the torrential rains that have been falling on the District. As I often do, I walked over to the National Museum of the American Indian to check out what was going on the marsh. The vegetation there has become so lush that one can imagine being outside of the city. Well, it takes more than a little imagination to forget the location. Though it is hidden from view by the dense foliage, there is a street close by with regular traffic, and the noise is hard to avoid. Still, the marsh has become very appealing. 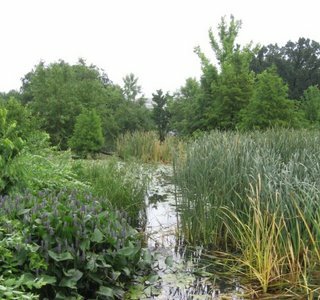 It has been planted with multiple species of aquatic or semi-aquatic plants. I do not pretend to be an expert on such things, but in the marsh itself I have picked out cattails, wild rice, water lilies, and a plant that resembles arum (except with purple flowers). And that is not counting the trees and various plants along the banks. It has turned out to be a delightful little spot. The birds like it, too. 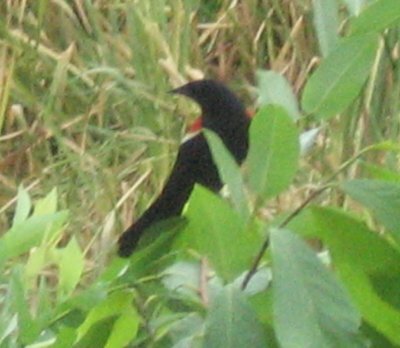 Red-winged blackbirds appear to be breeding here. I have seen them in the garden repeatedly over the past few weeks. Last week, on one visit I saw a female red-winged blackbird feeding a youngster. She was walking around on the lilypads, carefully stepping from one to another. Every so often she would stop and look under one. Finally she found what she was looking for and carried the prey up to feed her fledgling, which was perched on a cattail stalk. Rock pigeons, of course, are at home all over the Mall. The bird above is a variant form. 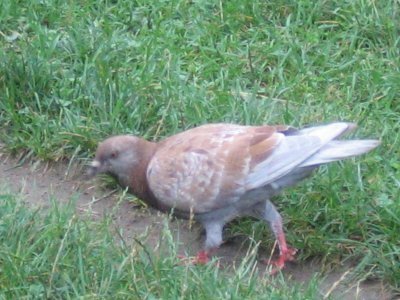 While most rock pigeons are slate-gray, many come in a variety of whites, browns, blacks, and grays that differ from the standard model. Even though the sun broke through briefly, you can see the storm clouds already rolling in for the next wave of rain. By midnight last night, a total of 9.94 inches of rain had fallen at Reagan National Airport in the two days since midnight Saturday. That was believed to be the highest rainfall figure recorded there for any two consecutive calendar days. The 7.09 inches of rain recorded at the airport in the 24-hour period from 7 a.m. Sunday to 7 a.m. yesterday is second only to the 7.19 inches recorded when remnants of Hurricane Agnes passed through the region in June 1972. A Feel Good Production has pictures from a flooded Rock Creek. The heavy downpours of the last two days have been causing some major problems on the region's transportation systems. The Beltway is shut down around the Wilson Bridge because of a mudslide along Cameron Run, and several other roads are shut down in places, including Independence and Constitution Avenues along the Mall. Amtrak, MARC, and VRE are all either shut down or have limited service in and out of DC. Several Metro stations are closed due to flooding as well. (See here for closings.) What a mess! And there is plenty more to come, as rain is predicted for the next several days. At least the mini-drought is over. Update: Apparently the waters of Cameron Run have flooded a housing development in Huntington in Fairfax County. The articles describes the waters as "sewage-infested" but does not give further explanation. I guess Fairfax has the same problem as DC in that regard. Robins, it turns out, appear to be taking the hit for humans, getting sick and dying as did thousands of crows that were infected in the first wave of West Nile virus after it arrived in North America. Thanks to the robins, humans who frequent the 26th Street dog park and similar areas have a lower chance of contracting the virus, at least in spring and early summer months. The reason? To mosquitoes, robins are far more tempting meals. "Robins begin to migrate south in late July and August," Kilpatrick said, "leaving mosquitoes on the hunt for blood from another source." That source turns out to be Homo sapiens . The number of human infections with the virus shoots up come the dog days of August. Then it's mosquito vs. man or woman, instead of mosquito vs. robin. Whatever you do, do not blame the birds! The mosquitos that carry the disease were most likely brought to North America on a very man-made airplane. You can only get West Nile from a mosquito bite, not from contact with an infected bird. Foggy Bottom near the Watergate Hotel is one of a number of urban hotspots for mosquitoes carrying West Nile virus -- and for Americanrobins. Other hot spots include the areas around the Hirshhorn Museum,the National Gallery of Art and the National Museum of Natural History.Not to mention Bethesda and Ridgeley's Delight, a posh neighborhood inBaltimore near Orioles Park at Camden Yards. I am not sure that any of those sites qualifies as a "local bird paradise," as the title of the article suggests. Most of these are very compact areas with little space for breeding or foraging, and they are places that most birds avoid for that reason. Read the original article in PLoS Biology. Al Gore has a terrifying message for us. Meanwhile, the DC area has been getting soaked pretty heavily. The rain was coming down in buckets earlier this morning, and there is more on the way. I imagine that the Anacostia River is not smelling so good right now. Starving baby pelicans are turning up on California beaches in large numbers. The cause is uncertain. Some speculate that the local pelican population has outgrown its food supply, while others wonder whether the problem is a reduction in the supply of sardines and anchovies. NY Times covered the trend of buying carbon credits to offset one's production of greenhouse gases in day-to-day living. I tend to be somewhat dubious about the usefulness of the programs because either way the pollutants are still going into the atmosphere. Some programs act more directly than others. It looks as if a pair of whooping cranes in Wisconsin have hatched a chick, the first wild whooping crane chick to hatch in the Wisconsin population. I have not been to the Arboretum in quite some time. In fact I have not been doing a whole lot of birding at all for the past couple weeks. So this morning I decided to change that by getting myself over to the Arboretum for a morning bird walk. When I stepped off the bus near the visitor center, a barn swallow whizzed past me. I followed the course of its flight, which led my eye to a mud nest under the visitor center eves. 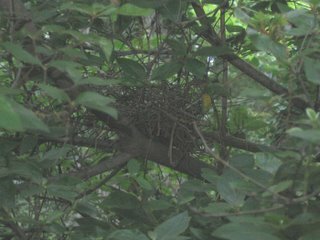 There were at least two chicks in the nest, and possibly more. The picture at right has one of the parents keeping watch. The atmosphere has changed there quite a bit since my last visit towards the end of the spring migration season. Birds are a lot quieter now. As spring ends and summer begins, they need to put more energy into feeding newly-hatched fledglings and less into territorial posturing. 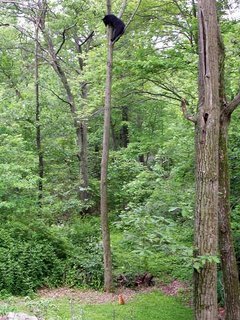 Acadian flycatchers, eastern wood-pewees, and eastern towhees were still singing; there were good numbers of all three in the Azalea Gardens and in the woods across the street from Mount Hamilton. One very weird song made me stop and listen for a long time. Eventually I decided that it must be a variant northern parula, though I never did find the singer. 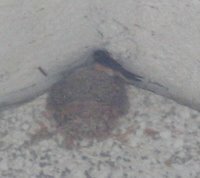 One sign of nesting is the incomplete nest below. I am not sure what species built this or why it is incomplete. Most likely it was either (a) the work of a parent who was killed or scared off before finshing the job; (b) the start of a nest for a second brood or a couple getting a late start; or (c) a dummy nest. Some of the fields behind the state trees grove have been left unmowed for now. Today there was nothing out of the ordinary, just lots of chipping sparrows. But if it is left unmowed when fall migration rolls around in a couple months, the field will bear watching. The other big no-mow area is around the Capitol columns and near Fern Valley. Today those meadows sported some loudly singing indigo buntings. There were also first-summer Baltimore and orchard orioles. Wildflowers are now in their full glory. 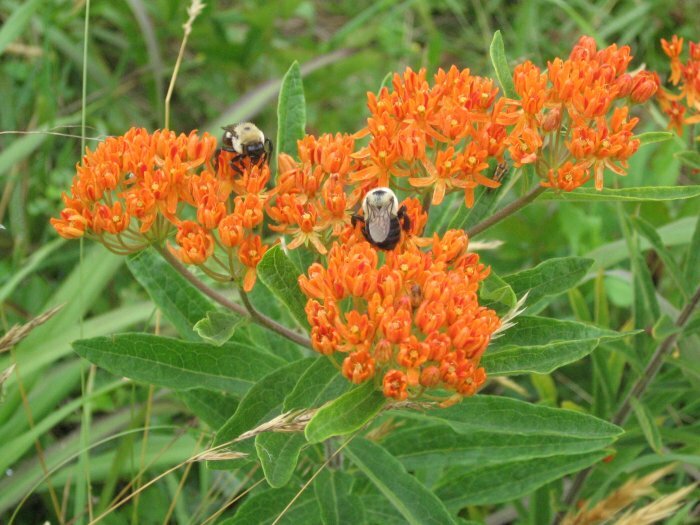 The picture above shows one of the many Butterfly Weed plants that dot the meadow by Fern Valley. The same area was full of Joe-Pye Weed. I do not normally associate that plant with strong smells, but this morning it was very fragrant. 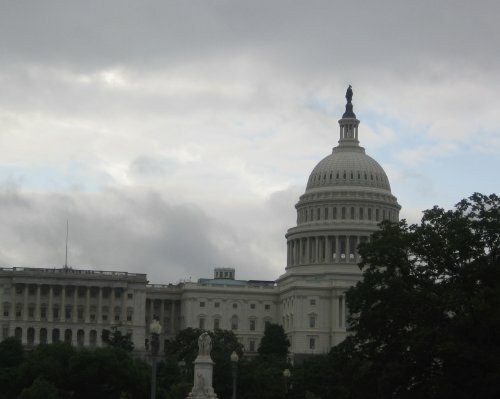 Last year Rep. Sherwood Boehlert of New York asked the National Academy of Sciences to study the evidence for global warming and determine if a consensus existed. The study was meant to address controversy over the so-called "hockey stick graph" that shows a sharp increase in temperatures in the second half of the twentieth century. NASA scientists have concluded from direct temperature measurements that 2005 was the hottest year on record, with 1998 a close second. Because direct temperature readings only date back to 1860, however, Penn State University climatologist Michael Mann and two colleagues used "proxy" data from ice cores, coral reefs and lake sediments to estimate temperatures back 1,000 years in creating the "hockey stick" -- which gained its name from its distinctive shape. Panel member Kurt M. Cuffey, a geography professor at the University of California at Berkeley, said at a news briefing that the report "essentially validated" the conclusions Mann reported in 1998 and 1999 using temperature records. The panel also estimated there is a roughly 67 percent chance that Mann is right in saying the past 25 years were the warmest in a 1,000 years. But it noted it is difficult to draw conclusions on temperatures before 1600 because, Cuffey said, "you start relying more and more on data from fewer geographic locations." But Sen. James M. Inhofe (R-Okla.), another skeptic, said the academy's report highlights the flaws in Mann's conclusions: "Today's NAS report reaffirms what I have been saying all along, that Mann's 'hockey stick' is broken." Sen. Inhofe, also known as the cretin who tried to strip Metro's funding a few years ago, has continually repeated this and similar lines, to the point that quoting him does not add any substance to a story. Unfortunately, he is chairman of the Senate's Committee on Environment and Public Works. So his opinion counts more than anyone else's when it comes to public policy decisions. This is one of many reasons we would be better off with a Democratic majority. Read the full NAS report if you want to see more detail. Back in April I made a list of the birds I thought were most beautiful and asked other bird bloggers to name their own. The result was a great response, with some bloggers challenging the idea of judging a bird's beauty, and others challenging the meme's North American bias. Now I would like to do the corollary exercise, naming favorite bird songs. Birds enchant us not just for their visual beauty, but also for their many vocalizations - some harsh, some soothing, some delightful, some comical. Here are my favorites (numbered, but not ranked). Winter Wren: This tiny bird's song has appealed to me ever since I first learned it. It has the energy and complexity of most wren songs, but with an ethereal quality that makes it seem to have no earthly source. Veery: All thrush songs are beautiful, but the veery's is spectacular. I learned this song before I really started birding, though I did not know what it was at the time. House Finch: I associate this finch's song with the coming of spring, since it is one of the first that I hear singing in March in my urban neighborhood. Yellow-rumped Warbler: The song itself is not remarkable, but I like it because it calls to mind early spring migration, when the birding possibilities seem limitless. Baltimore Oriole: Unlike other bird songs, where pattern is frequently the key, an oriole's song is distinctive for its clear flute-like quality. Cerulean Warbler: I would welcome hearing this buzzy, rising song more often. Red-shouldered Hawk: This bird's vocalization is not truly a song but a call. Yet I have it on my favorites list because red-shouldered hawks demand to be heard. Northern Mockingbird: I list mockingbirds in appreciation for their talent of mimicry. Listening to a mockingbird is like putting your bird song CD on shuffle. Field Sparrow / Prairie Warbler: It was hard to choose between these two, because I like both for the same reason - the optimistic bounciness of their songs. When I hear these songs early in the morning, I cannot help but think it will be a good day of birding. Apologies to: White-eyed Vireo, Rose-breasted Grosbeak, Eastern Towhee, and all other thrushes and warblers. I am not tagging anyone with this, but if you would like to contribute your own thoughts, go right ahead. 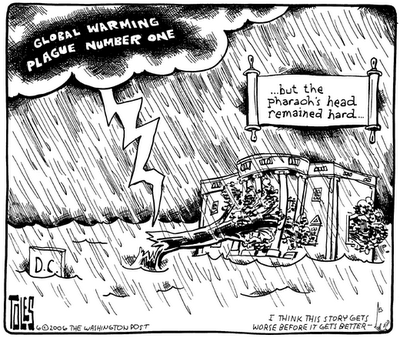 Tom Toles, the political cartoonist for the Washington Post, sketches out two cartoon ideas every day, and then inks up the one he prefers for the printed publication. However, both the printed cartoon and the other sketch get published on the Toles Archive. Sometimes the sketches themselves are pretty biting. The next issue of I and the Bird (on July 6) will be its first anniversary. For that occasion, it is returning to its original host and founder, 10,000 Birds, for a themed issue. Mike is calling for posts on one (or more) of three questions: why do you bird, why do you blog, and why do you blog about birds. For details, see here. Happy Solstice, everyone! Right on time, DC has delivered a classic week of summer weather: high heat and high humidity. On Monday the temperatures got close to 90°F, and then a late-day thunderstorm brought the humidity level above 90%. It makes me long for winter. And now on to the regularly-scheduled news and links about birds, birding, and the environment. The Army Corps of Engineers has suspended permits for mountaintop removal mining to determine whether or not the permits are legal. The practice threatens water supplies for residents in the Appalachians and destroys valuable habitat for birds, including the declining cerulean warbler. There is evidence that increased coal-bed methane development is hurting sage grouse populations in Wyoming and Montana. So far, the federal government has resisted putting the sage grouse on the Endangered Species List. Minnesota is asking that landowners wait until August to mow roadside ditches to protect ground nesting birds. A Dutch researcher has found that bird parents respond more to some offspring than others, and that males and females will sometimes split duties based on the individuals they prefer. One parent will occasionally abandon the brood. The study (published in Animal Behaviour) focused on black redstarts. Some other species use cooperative parenting arrangements. Aydin has the news that this coming weekend will feature the Potomac Gorge Bioblitz. There is serious research underway, but some programs are open to the public, so check out the link if you are interested. The second red-tailed hawk nestling at the Cathedral of St. John the Divine in Manhattan finally fledged this weekend. The latest Carnival of the Vanities is up at Rethink(IP). My review Flock is included. In the Birds of the Mid-Atlantic series so far I have covered only birds that I have seen myself. One eastern bird that I have not seen but would very much like to see is the golden-winged warbler. Golden-winged warblers breed in a wide band across the upper midwest and southern Canada (see BBS map). In the mid-Atlantic region, one is most likely to find them breeding in the middle and higher elevations of the ridge and valley province. During spring and fall migration the birds may be seen over a much wider area. Males have a bold black and white facial pattern with a yellow cap and yellow wing coverts. Females have the yellow coverts but without as bold of a facial pattern. Golden-winged warblers behave much like chickadees, as they forage energetically and occasionally hang upside-down. The golden-winged song resembles that of the blue-winged warbler, but with a repeated second syllable. Like cerulean warblers, golden-winged warblers are in steep decline, enough to get the species red-listed on the Audubon Watch List. The causes for this warbler's decline are similar to those of other eastern songbirds, with habitat loss leading the list. 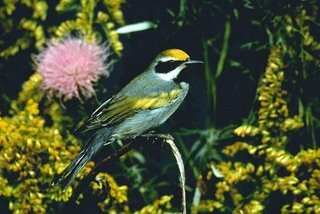 Golden-winged warblers favor early successional habitats, which are associated with human disturbance such as old fields and power line cuts. As old fields grow into mature woodland, the lost habitats are often not being replaced by new old fields due to land use changes. Some of the decline is attributable to other bird species. 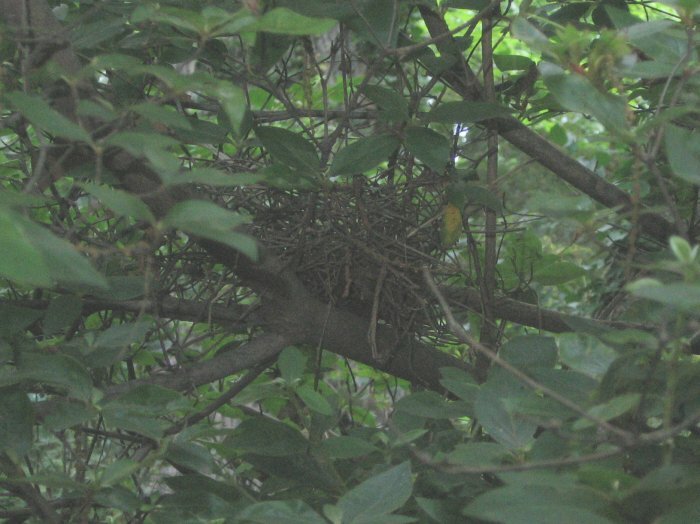 Birds nesting in edge and early successional habitats are especially vulnerable to brown-headed cowbirds, and the golden-winged warbler is no exception: about 30% of this species's nests receive cowbird eggs. Hybridization and competition with blue-winged warblers (yellow-listed on the Audubon Watch List) may also contribute. Blue-winged warblers are steadily invading the golden-winged's former range. Where the two species overlap, hybrids are common. A first-generation hybrid (i.e., blue-winged X golden-winged) is known as a Brewster's warbler; second generation backcrosses result in the Lawrence's warbler, which is much rarer. As blue-winged warblers enter the territories of golden-winged warblers, the latter slowly are pushed further north. How can birders help? One way is to report sightings and participate in research programs that will guide conservation efforts. The Cornell Lab of Ornithology is conducting a multi-year Golden-winged Warbler Atlas Project to determine the breeding distribution and habitat requirements for the species. This year's project is drawing to a close, but the opportunity to participate will probably be open again in future years. Many local bird clubs, ornithological societies, and government agencies may also be able to use sighting information. (West Virginia, for example, asks for reports.) If you have seen either blue-winged or golden-winged warblers outside of the United States and Canada, you can send this information to the Alianza Alas Doradas. Crossposted at the Blue Ridge Gazette. The Supreme Court has sent the cases of two Michigan landowners who wanted to develop wetlands on their properties but were stopped by federal regulators. The case seemed to hinge on how close a wetland needed to be to a navigable waterway to fall under the Clean Water Act. In one of the two consolidated cases, John A. Rapanos, 69, faced up to $13 million in penalties and more than five years in prison for filling in 54 acres of land in central Michigan that the government deemed "adjacent wetlands." He planned to build a shopping center on the property, which he said was 20 miles from the nearest navigable waters. However, the Cincinnati-based U.S. Court of Appeals for the 6th Circuit found that hydrological connections -- in this case ditches and man-made drains -- linked his property to systems that ultimately drained into navigable waters. 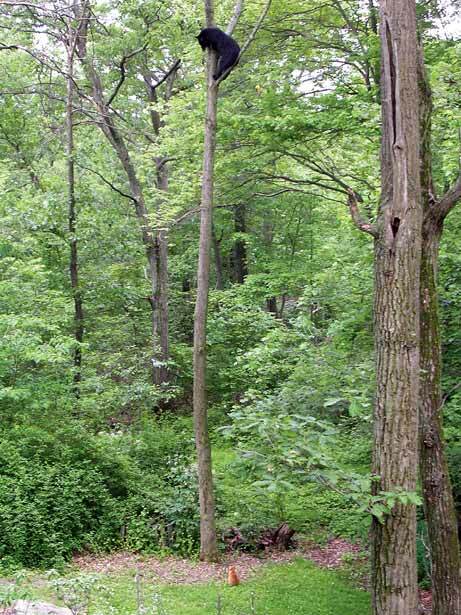 In the other case, June Carabell has been fighting the Corps of Engineers over her plans to build a condominium complex on nearly 16 acres of wooded land in Chesterfield Township near Detroit. In her case, the 6th Circuit Court of Appeals decided that the property was an adjacent wetland because only a man-made earthen berm separated it from a ditch that constituted the initial connection to a drain and a creek leading to Lake St. Clair, part of the Great Lakes drainage system. If you would like to read the decision, you can find it here (pdf). Visit the Best of Me Symphony #134 at the Owner's Manual. I submitted one of my oldies, Storm Birds, in honor of the newly-begun hurricane season. Hurricanes bring death and destruction... and exotic birds. As always, Gary has set up a theme for the weekly carnival. Any blogger can submit to this ongoing carnival. The only requirements are that the blog post be at least two months old and that you should still think it is a good post. The Washington Post this morning is touting an underground vault in the far north designed to safeguard agrocultural seeds. The vault is on the island of Svalbard, part of Norway, which is paying for construction costs. Its precious contents? Seeds -- millions and millions of them -- from virtually every variety of food on the planet. Scientists estimate there are 2 million varieties of plants used forfood and forage today. That includes an astonishing 100,000 varietiesof rice, the major staple of the human diet, and more than 1,000varieties of banana, a nutritious fruit of global importance. Seedsfrom these crops, which can be smaller than poppy seeds and as large ascoconuts, are invaluable repositories of plant DNA. They are the rawmaterial that farmers and researchers rely on to develop moreproductive and nutritious plants that can cope with climate change, newdiseases or pests. Of course, the usefulness of the seed bank would depend a great deal on the extent to which humans survived such a disaster. Or at the very least it would depend on the survival of people who know how to open the vault, and the survival of its contents. Being as that may be, it certainly is in a picturesque location. The design, described in a recently released feasibility study,bespeaks that Armageddon mentality. First, there is the location: Thestarkly beautiful and always frozen terrain of Svalbard is, to say theleast, off the beaten track. Home mostly to a small community ofscientists, coal miners and support staff, it is the northernmost placein the world with scheduled commercial air service. Arctic foxes, reindeer and polar bears stroll the streets. We frequently hear from politicians that the media is not spending enough time reporting the "good news" from Iraq. Well, there is certainly enough bad news to keep reporters busy. The problems are not limited to violence. Last night, the NY Times reported that the Iraqi Oil Ministry has dumped millions of barrels of petroleum waste into mountain valleys in northern Iraq and set the oil on fire. The result has severely threatened air quality in that region, as well as drinking water along the Tigris River from northern Iraq to Basra. The scale of the problem is astounding - 40% of Iraq's crude oil production results in a waste product called "black oil." Under normal circumstances, this would be further refined for lower grade products. But Iraq's refineries, which still have not fully recovered from years of war and economic sanctions do not have this ability, and the political situation is apparently too unstable to ship it out of the country for further refining in foreign plants. So instead, large amounts of this precious resource are simply wasted and allowed to become a health threat to the people of Iraq. One year ago today I started A DC Birding Blog with this post. After 465 posts, I am still here, and still writing. Since then, this blog has had almost 19,000 visits and over 35,000 page views. This is modest, to be sure, but more than I originally expected. When I started out, I was unsure if I would be able to keep it going. I had started a blog once before, but never posted after the first post or two. The problem then was that I had no real plan for the blog or ideas for writing. I also think that I did not care sufficiently about the topic to write about it regularly. This blog, though, has survived. Before I signed up for my account on Blogger I thought about why I wanted to write and what sort of topics I ought to write about. Birding turned out to be a good idea, since I bird regularly, and my birding walks would be a good fodder for writing. Thanks to my involvement in I and the Bird, this blog has allowed me to interact with the many other bird nuts who inhabit the blogosphere. I won't go into names, since I will probably leave someone out accidently. In the last few months, I have had the pleasure of engaging in a group blogging effort over at the Blue Ridge Gazette, a project that encouraged me to start a new weekly series on this blog, the Birds of the Mid-Atlantic. For now, at least, my plan is to continue writing this blog with more or less the same features and same types of posts as have been here over the past year. I do hope to add reviews as a regular feature in the near future (as soon as I finish reading a few books!). If there are other types of content that you would like to see here, please leave a note in the comments or drop me an email. As regular readers may remember, the WMATA recently held hearings to determine the fates of several underperforming bus routes, many of which it planned to eliminate or cut back. One of these routes was the X6, the main bus route that serves the National Arboretum. Decisions have not yet been made, but if you want to see the results of the hearings, you can reference this PDF file. Route X6 was established as experimental service effective March 31, 2001, in order to provide direct bus service between Union Station and the Arboretum. The route serves all bus stops along the route via Maryland Avenue and Bladensburg Road. Service operates between 8 AM and 5 PM on weekends and holidays. Current ridership is approximately 90 passengers per day, which is an average of three passengers per trip. Approximately 40 percent of riders board or alight at the Arboretum stop. • We are working with Arboretum officials to find alternative funding to operate service. • Service will be retained for a portion of the year; details will be worked out with the “Friends of the Arboretum”. So there appears to be some reason for hope that the route will be maintained. I hope that a solution can be worked out between the WMATA and the Arboretum. Best entry wins a book from Wildbird. This week a new browser debuted in public beta. Flock 0.7 is now available for download. Flock is an open-source browser based on the Firefox model, and shares many of Firefox's distinctive characteristics, such as tabbed browsing, built-in search box, easy customization, and amenability to extensions. In fact, many beloved Firefox extensions have been retooled to work in Flock. Flock, however, was not designed just to be a Firefox spinoff. The purpose of the new browser was to integrate web 2.0 uses into the browser's normal functioning. Now this can mean different things to different people. In the case of Flock, this means making it easier to blog, read news feeds, share photographs, and maintain social bookmarks. You can read more about the goals of the project here. With that in mind, I would like to give my thoughts on some of the unique aspects of the new browser. Bookmarks/Favorites: I do not make much use of social bookmarking myself, so I am not the best person to comment on these features. It will suffice for me to say that the feature is fairly easy to set up, and you have a choice of del.icio.us or shadows. "Favorites" are automatically imported from your previous default browser. You can choose whether or not to make these public. Unfortunately for me, Flock broke apart my subfolders into top-level folders of their own, so that it is now hard to tell one from another. Blogging: The blogging function, like the other social functions, is easy to setup. One can post to multiple blogs on different accounts. Right now, it is able to post to Blogger, Drupal, LiveJournal, MoveableType, Typepad, and WordPress through a WYSIWYG editor that provides the capability to edit source code, where necessary. It includes an option to add Technorati tags if you post through "File -> Publish to Blog..." rather than the "Publish" button on the editing window. It is also imperative to use the "File" menu to publish if you have several blogs registered and wish to make sure you publish to the correct one. I wish that there was a way to set one blog as the default. Newsreader: News feeds (RSS/Atom) can be imported into Flock from other readers with varying degrees of ease. This browser makes it easy to add new feeds by clicking on the orange feed button in the location box and then working through a dialogue. Feeds open in a separate pane on the left side of the screen, much like the Firefox extension Sage. Flock will not replace online newsreaders such as Bloglines or Feedburner for users who prefer that method of monitoring feeds. However, the built-in reader is a worthy replacement for the Sage extension from the Firefox browser, with two exceptions. One is that there does not seem to be a way to order the reader to check feeds; it does this on its own schedule. (To change this schedule, see here.) The second is that the newsreader does not seem to share Sage's lightweight and relatively fast performance. When I open the news, I have to click through two "script not responding" boxes before being able to read feeds; when the reader is running in the background, this can slow page loading and other functions to a crawl. General evaluation: This last issue points to my biggest problem with the Flock browser as a whole, namely its footprint on system resources. I use a slightly dated computer (about four years old) with limited RAM. At the current time, Flock uses about 140 Megabytes of memory during normal use, a bit more than my middle-aged system can handle. For those of you who, like me, have an older machine, I would recommend sticking with Firefox (or another worthy browser) as your primary browser for the moment. Certainly it is worth giving Flock a try, but this browser really needs more system resources for a user to take full advantage of its capabilities. Overall I have found the current version of Firefox to respond more quickly on my computer. Your own mileage may vary, of course. Perhaps the review so far sounds too negative. I actually do think that this is a promising browser. It just needs some improvement, which I am sure will come in future editions. I am a great fan of the open-source software movement, not only because it is free (always good), but also because it provides a more flexible model for developing new uses. In any case, it is worthwhile for bloggers or others who spend time online to download it and take a look at its features. You may find the new functions useful. The oldest known ancestor for modern birds was recently discovered in China and was announced yesterday. Paleontologists have unearthed the exquisitely preserved fossils ofwhat is the oldest known ancestor of modern birds, a loonlike swimmerand flier that flourished in lake country 110 million years ago in whatis today northwest China. 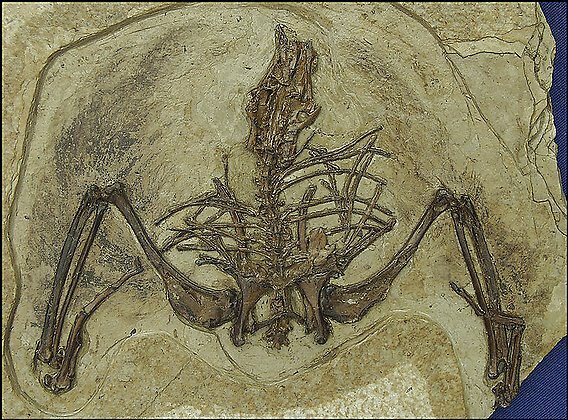 The fossils included five headless butotherwise nearly complete skeletons that show the outlines of softtissues, including feathers and ducklike webbing between the toes.Researchers said the find suggested modern birds may have evolved fromaquatic ancestors. An international team led by Hai-lu You, of the Chinese Academy of Geological Sciences, found the fossils, known as Gansus yumenensis, in Gansu province near Changma, a mountain community about 1,200miles west of Beijing. Results of their research are reported today inthe journal Science. "They were clearly able to fly but were alsoadaptable for swimming and diving," said team member Matthew C.Lamanna, of the Carnegie Museum of Natural History. "We don't know what they ate because we don't have a skull, but the legs and feet are thoseof a diver. He had a powerful kick stroke." Gansus is being compared in appearance and behavior to modern loons, grebes, and diving ducks, but was actually fairly small. The Post article says it was close to magpies in size; perhaps a murrelet or auklet would be a closer analogy for something that small that spends most of its time on the water. The modern diving birds spend almost their entire lives on the water, some of them coming ashore only to breed. Grrlscientist has more on the implications of the discovery, and how this fossil fits into the avian lineage. One of the interesting implications is that modern birds evolved from primarily aquatic species after most terrestrial species had become extinct. This is just something that will need to be worked out later. Today President Bush plans to declare the northwest portion of the Hawaiian Islands as a marine reserve. The roughly 100-mile-wide area encompasses a string of uninhabited islands that support more than 7,000 marine species, at least a fourth of which are found nowhere else on Earth. The islands include almost 70 percent of the nation's tropical, shallow-water coral reefs, a rookery for 14 million seabirds, and the last refuge for the endangered Hawaiian monk seal and the threatened green sea turtle. The area also has an abundance of large predatory fish at a time when 90 percent of such species have disappeared from the world's oceans. Encompassing nearly 140,000 square miles, an area nearly the size of Montana and larger than all the national parks combined, the reserve will just surpass Australia's Great Barrier Reef Marine Park as the largest protected marine area in the world. It will also, however, be one of the least accessible. In the same area, President Theodore Roosevelt had created a bird sanctuary on some islands in 1909. Protecting Hawaii's endemic species, both birds and otherwise, has been a special challenge for conservation organizations because of isolated populations and predators introduced by humans over the years. This should be one step in the right direction, with proper management. A turning point came in April, when Bush sat through a 65-minute private White House screening of a PBS documentary that unveiled the beauty of — and perils facing — the archipelago's aquamarine waters and its nesting seabirds, sea turtles and sleepy-eyed monk seals, all threatened by extinction. 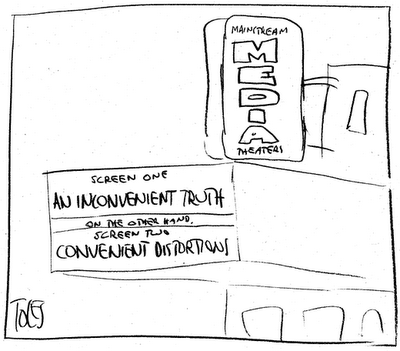 The film seemed to catch Bush's imagination, according to senior officials and others in attendance. The president popped up from his front-row seat after the screening; congratulated filmmaker Jean-Michel Cousteau, son of the late underwater explorer Jacques Cousteau; and urged the White House staff to get moving on protecting these waters. "He was enthusiastic," Cousteau said. "The show had a major impact on him, the way my father's shows had on so many people. I think he really made a discovery — a connection between the quality of our lives and the oceans." Someone ought to show him Al Gore's new movie. The remnants of Tropical Storm Alberto will skirt the Washington area late Wednesday, perhaps bringing much-needed rain to the metropolitan area, meteorologists said. The National Weather Service predicted a 40 percent chance of precipitation in the Washington area Wednesday afternoon and evening. "We're just on the edge of the path of the storm that was Alberto," said Weather Service meteorologist Andy Woodcock. "It might tease us a bit." Given the positioning of the storm, there may be a chance of some unusual birds being blown into the area. Since this is a weak system and it is early in the season, Alberto will probably not bring any major rarities. But it still may be worth checking along the rivers tomorrow morning to see if any birds came in from the ocean overnight. A week ago a house cat drove a bear up into a tree in New Jersey. According to the story, the cat was clawless, but managed to keep the bear in the tree until its owner brought it inside. This year, New Jersey's breeding population of piping plovers is down to about 100 pairs. The population is believed to be held in check by increasing predation by foxes. Appalachian ruffed grouse depend on a ready supply of acorns for breeding success. Unfortunately timber harvesting and deer browsing has reduced this supply in many areas. A cull of Canada geese in upstate New York has been frustrated by a group of residents who scare the geese away from the traps. The limited range of Bicknell's thrushes may be under pressure from the development of ski resorts in the Adirondacks and elsewhere in the northeast. The possible presence of a Kirtland's warbler may impede the development of a nickel and copper mine in Marquette County, Michigan. A Jersey birder has photographs of an adult Carolina wren feeding a presumed brown-headed cowbird fledgling. A wildlife rehabilitator who specializes in birds has been charged with being responsible for making his neighbors' cats disappear. They think that he trapped the cats and took them to be euthanized. Al Gore will be signing copies of his book, An Inconvenient Truth , at noon tomorrow (June 15) at Olsson's Books in Penn Quarter, on 7th St NW (between D and E Streets). Also tomorrow at 6:30 pm, there will be a lecture on what fossils reveal about the early evolution of birds. The lecture will be at the AAAS headquarters at 12th and H Streets NW. Mike at 10,000 Birds this morning wrote a post on the importance of conserving habitat in the Caribbean, not just for endemics, but also for North American species. So what North American species winter there? That is a big question, and one that I cannot answer adequately at the moment. But here are the North American warblers that are known to winter on islands in the Caribbean. That is 23 species of wood warblers that breed in North America and winter in the Caribbean. 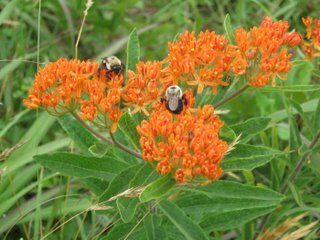 One may be extinct (Bachman's), another flirted with extinction (Kirtland's), and at least four more are on the Audubon Watchlist (Prairie, Prothonotary, Worm-eating, Swainson's). That should be reason enough to follow the conservation stories from the Caribbean, even without delving into the wintering ranges of other families. Last night I added some new links into all posts to make it easier to link posts from this blog on social bookmarking services. If you are logged into one of these services, just click the link and the work should be done for you. I picked these five because they seem to be most popular. Let me know if you would prefer to see different services represented here. If you want to add something like this to your own blog, see this post from Freshblog and this post at blog.del.icio.us, which explain how to do it. Basically you add a bit of code into your post footer in the template. For the code to link over 100 social bookmarking type sites, see 3spots. Quick Online Tips also has a full list of tools to use with del.icio.us.